Apple this week released a free utility called Lion Recovery Disk Assistant that provides an easy method for creating an official Lion Recovery drive from any 1GB (or larger) USB hard drive or thumb drive. You can download Lion Recovery Disk Assistant from Apple’s Support site; it’s about 1MB in size. Apple provides some brief instructions for using this utility, but those instructions don't give you the whole story—while the utility is indeed simple to use, there's a lot more you should know about creating and using a recovery drive. A must-have for any Mac user is some sort of bootable utility disc or drive—I call it an emergency drive, while Apple’s taken to calling it a recovery drive. If your startup drive gives you trouble, you can boot from the recovery drive and in many cases perform any necessary repairs. With luck, you’ll be back up and running in no time. As I explained in our hands-on with Lion Recovery, when you install Lion (Mac OS X 10.7) on a Mac with a supported hard-drive configuration, the Lion installer creates a hidden, 650MB partition called Recovery HD. You can boot your Mac from Recovery HD by holding down Command-R at startup (or by choosing it from within Startup Manager, which you access by holding down Option at startup); you’re then presented with options for verifying or repairing your normal startup drive and for reinstalling Lion. You can also browse the Web for troubleshooting info using Safari, and if worse comes to worst, you can even erase your startup drive and restore its contents from a Time Machine backup. Apple calls this feature Lion Recovery. However, there are some considerable limitations to Lion Recovery. The most significant is that since Recovery HD is a partition of your Mac’s startup drive, if that drive has hardware or partition-map problems, you may not even be able to boot from Recovery HD. Likewise, if you replace your Mac’s hard drive, the new drive won’t have a Recovery HD partition until you install Lion. So it’s still a good idea to have a separate bootable utility disk. One option for an emergency drive is to create a bootable Lion-install drive. Such a drive lets you install Lion on any Lion-capable Mac, but it also offers the same options as Lion Recovery. If you’ve got an 8GB-or-larger USB stick, or an external hard drive, I highly recommend creating a bootable Lion-install drive now so you’ll have it handy if you should ever have a problem. 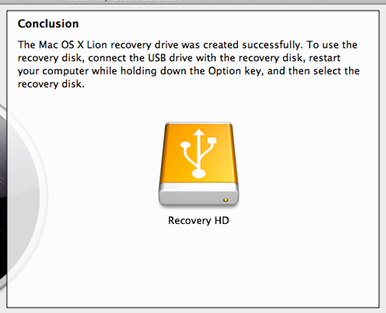 But with Lion Recovery Disk Assistant, you can now create a basic Lion Recovery drive in a few simple steps. While such a drive isn't quite as handy as a bootable install drive—more on that below—it's a useful tool to have. To use Lion Recovery Disk Assistant, your Mac must already be running Lion and have a Recovery HD partition, as the utility uses the data on Recovery HD to create the Lion Recovery drive. In addition, the target USB stick or USB hard drive must be formatted with a GUID partition map. You can check this by connecting the USB drive, launching Disk Utility (in /Applications/Utilities), and selecting the drive in the list on the left; the type of partition map is displayed near the bottom of the window, next to Partition Map Scheme. If you’re using a drive that's significantly larger than 1GB, you may also want to partition the drive into at least two partitions: a 1GB volume for Recovery HD and one or more other partitions for general use. If you don’t take this step, the entire drive will be used for Recovery HD, which means a lot of wasted space on larger drives. Connect the USB drive you want to use for Lion Recovery. Launch Lion Recovery Disk Assistant and then click Agree to agree to the software license agreement. Select the target drive—the one you want to use for Lion Recovery—and click Continue. (If the target drive has multiple partitions, select the particular partition you want to use for Recovery HD.) Note that as the onscreen message explains, any data on the selected drive or partition will be erased. You’ll be prompted to provide the name and password for an administrator-level account; do so and click OK.
You’ll see a message that the utility is creating the recovery disk. In my testing with a 4GB USB stick, this process took only about 40 seconds. Afterward, the utility will verify the disk; this took about 25 seconds for me. When the process is finished, you’ll see a message that the recovery drive was created successfully; the drive will appear in Lion Recovery Disk Assistant with the name Recovery HD. Connect your new emergency drive to one of your Mac’s USB ports. Restart (or start up) your Mac while holding down the Option key. After a short delay, you’ll see Startup Manager—a gray screen showing all connected, bootable volumes. Choose a local Wi-Fi network from the pop-up menu and provide the network’s password. Select Recovery HD and then click the upward-pointing arrow below Recovery HD to boot from it. (If you see two volumes named Recovery HD, the one with the USB icon is your USB drive; the other is the recovery partition of your Mac’s internal drive.) After another short delay, you’ll see the standard Lion Recovery options. In my testing of the initial release of Lion Recovery Disk Assistant, I encountered an apparent FileVault conflict. If I used Lion Recovery Disk Assistant to create a recovery drive while FileVault was disabled, the resulting drive would successfully boot any compatible Mac, whether that Mac had FileVault enabled or disabled. However, multiple recovery drives created on Macs with FileVault enabled would not boot compatible Macs, regardless of whether the Macs being booted had FileVault enabled or disabled. Where is the new emergency drive or partition? Like the Recovery HD partition created on your startup drive when you install Lion, the new Recovery HD partition of your USB drive won’t appear in the Finder—it’s invisible. Similarly, if you open Disk Utility, you’ll see the USB drive itself, as well as any other partitions on that drive, but not the Recovery HD partition. The reasons for this are obvious: Because Recovery HD—whether created on your startup drive by the Lion installer or on an external drive using Lion Recovery Disk Assistant—is for emergencies, Apple doesn’t want you to mount it in the Finder and accidentally or purposely modify it. If you really want to see it in Disk Utility, open Terminal (in /Applications/Utilities), paste the following command (without the trailing period), and press Return: defaults write com.apple.DiskUtility DUDebugMenuEnabled 1. Then launch Disk Utility and choose Show Every Partition from the new Debug menu. Recovery HD will magically appear. In fact, you’ll likely see two versions of it: the one that’s part of your startup drive and the new one that’s part of your USB drive. You can select either of these Recovery HD partitions and click Mount to mount Recovery HD in the Finder and take a look around. Just be careful not to change the partition’s contents in any way—you may prevent it from working properly—and to unmount it when you're done. You may be wondering which is better to have on-hand: a recovery drive created with Lion Recovery Disk Assistant or a bootable Lion-install drive. If you’ve already used our instructions for creating a bootable Lion-install drive, you don’t need to create a Lion Recovery drive using Lion Recovery Disk Assistant. The Lion-install drive provides the same interface with the same options for using Disk Utility, browsing the Web with Safari, reinstalling OS X, and restoring a drive from a Time Machine backup. If you haven’t yet created a bootable Lion-install drive, should you? Or should you just use Lion Recovery Disk Assistant to make a recovery drive? 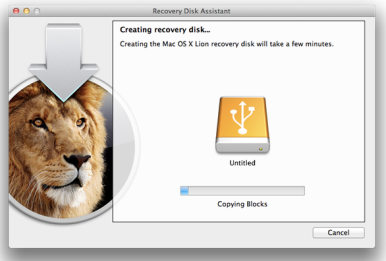 The advantages of Lion Recovery Disk Assistant are two-fold. First, it’s easy to use. Second, it works with USB thumb drives with as little as 1GB of capacity, making those old 1GB drives you paid too much for five years ago, or got for free at the last conference you attended, useful again. However, if you’ve got a larger USB drive (at least 5GB), creating a bootable Lion-install drive has a compelling advantage: It contains nearly all the data necessary if you decide to reinstall Lion on your Mac’s startup drive or to install Lion on an empty hard drive. With a basic recovery drive—as with Lion Recovery and Lion Internet Recovery—reinstalling Lion requires the installer to download nearly 4GB of data on the fly.